Joylato is a perhaps one of the most interesting ice cream shops in Reykjavik. The ice cream is frozen with liquid nitrogen, everything is organic or locally sourced and almost everything sold is also available vegan. There are no additives, no corn syrup or refined sugar and no binding agents. It’s pretty much as healthy as ice cream can get. Joylato is located both on Njálsgata 1, central Reykajvik, and on Laufbrekka 30, Kópavogur. The staff at Joylato makes just about everything from scratch, or as much as they can. The flavourings for the ice cream, the vegan base (from coconut, cashews or other). The dairy comes straight from a farm in West Iceland. The ice cream is blended and frozen to order. There are seven flavourings, in addition there’s a special that changes every week (one in winter, two – three in summer). The ice cream shop is completely gluten free. There’s a wafer that comes with the ice cream, which is gluten free, you can also get gluten free waffles. It’s a nice place to come and sit down for a cup of something warm if you’re not in the mood for ice cream. There’s latte, tea, cocoa (which is available dairy free made from their own nut milk), and more. On October 12, 2016, 4 days after the finish of the 49 nation, 25,000 km, 8 month European Peace Run in Rome at the Colosseum the members of the Peace Run were truly blessed to be part of the Papal Audience at St. Peter’s Basilica. After the mass Pope Francis took a moment to bless the torch and receive gifts of artwork and messages from children around the world. They also presented some of Sri Chinmoy’s writings and artwork. More pictures on: peacerun.org. Recently a huge new Meditation Center has been inaugurated in the Czech town of Zlin. Included are rooms for lectures, a Madal Bal Shop, a Gallery with Sri Chinmoy’s artwork and a vegetarian restaurant called “Pranaya”. 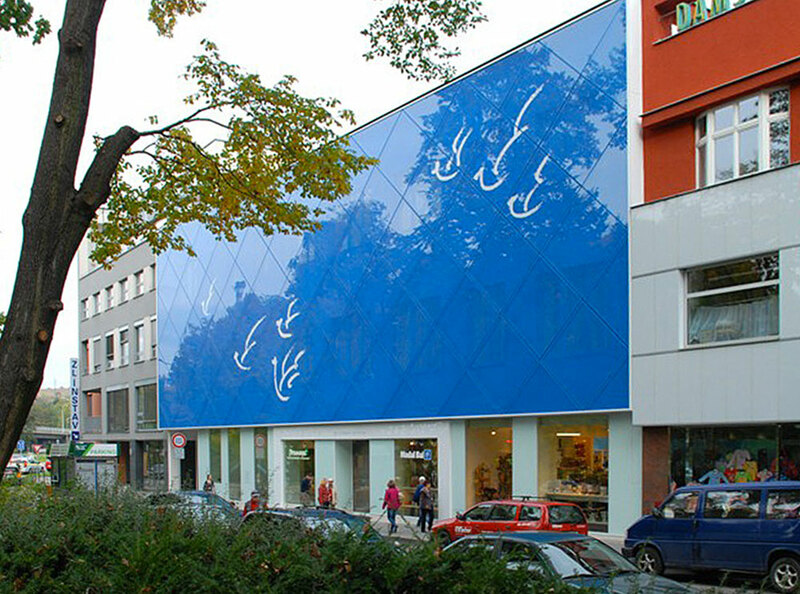 The building and shops belong to Czech students of Sri Chinmoy. Photos by Ashish Zubaty. Zen’s ancient teachings seem a mystery to many. But actually, Zen is very simple: Zen means attaining my true self — “What am I?” In this revolutionary film by acclaimed filmmaker Christine Schmitthenner, we see a Western Zen monk in his daily activities in the world: chanting, meditating, preparing breakfast, riding public transport, meeting with friends, even shaving his head — from moment to moment, not attached to conceptual thinking, everything is Zen, which just means everything is “moment.” The subject of this unusual film, Hyon Gak Sunim, allowed filmmakers to follow his daily living and teaching activities for a week as he met with students and organized his daily activities. Sunim is widely recognized as one of the most influential Zen monks in modern Korean Buddhist history, a graduate of Yale and Harvard who entered the monastic life in 1992 and has done over 20 years of intensive Zen training in the ancient Zen temples of Korea. His enlightenment was certified (“inka”) in a public ceremony in 2001 by his teacher, the legendary Zen Master Seung Sahn (1927-2004). Now based in the West, he wanders the world, teaching wherever invited. 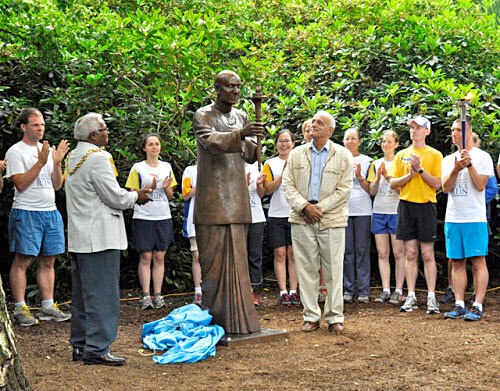 Recently a statue of Sri Chinmoy holding a Peace Torch was dedicated at Chantery Park, Ipswich, England. The statue was a gift from the Oneness-Home Peace Run, and marked the culmination of a week long Peace Run from Cardiff to Ipswich. Sri Chinmoy visited Ipswich on two occasions, in the the 1980s and 1990s, and the city is a member of the Sri Chinmoy Peace Blossoms programme. Several athletic events have also been offered by the Sri Chinmoy Marathon Team in Ipswich over the years. The organiser of the event, Martin Spettigue commented that: “We want to offer something that will inspire people to think more and more about peace and to understand how important peace is to an individual.” The Mayor of Ipswich offered his gratitude to the Peace Run team for kindly offering this symbol of peace and said it would be a great asset to Chantery Park. During the ceremony, the Peace Run offered a ‘Harmony Torch Bearer Award’ to the Reverend Clifford Reed (a poet, artist, and Unitarian Minister for 36 years.) The ‘Harmony Torch Bearer Award’ is a recognition for individuals who have selfless offered a positive contribution to their local communities . The Reverend Clifford Reed was honoured, amongst other achievements, for his sterling work in bringing different religions together. 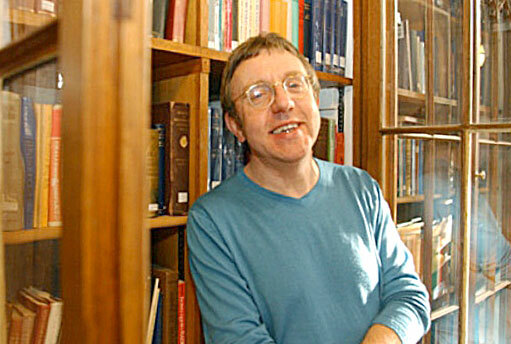 He was a founder member and chairman of the Ipswich interfaith movement. He is also a leading poet, and writer. The Sri Chinmoy Oneness-Home Peace Run is an international event which seeks to promote peace and harmony across the world. 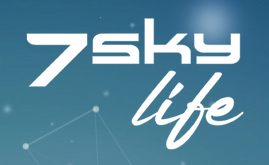 Since its inception in 1987, it has travelled through many countries and given thousands of people the opportunity to participate in offering a wish for world peace. This year, the British Peace Run, began in Cardiff and travelled across the country through Bristol, Oxford and Cambridge before arriving in Ipswich. The Peace Run started with the Mayor of Cardiff offering a message of goodwill to the other mayors along the way. The world has been marching to war, Sri Chinmoy has been running for peace… those words were spoken at the funeral of the spiritual giant in 2007. Six years later Chinmoy’s defiant message of hope lives on. We all live and move in our own worlds, our own circles, circumscribed by work, family, friends, the choices we make. But we also live in the wider world, affected by great forces of change – social and political upheaval, the vagaries of climate, the state of the planet. And from time to time something in our own smaller world makes the news, or something out there impinges on us or resonates powerfully. A few weeks ago, I switched on the TV and tuned in to Channel 4 News. The main story was about the sudden floods affecting Europe. Jon Snow was talking about the damage caused, the lives lost, and film footage appeared behind him. One image in particular stayed on screen for some time. It showed a statue on the banks of the Vitava River in Prague. 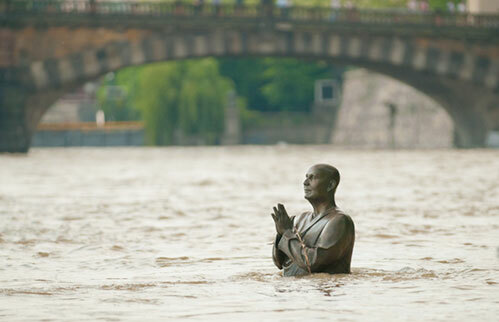 The flood waters had risen, flowing round the statue, almost engulfing it, but not quite. What remained visible was the top of the statue, a powerful Buddha-like head above broad shoulders, hands folded in prayer, cleaving the waters. The image was intensely dramatic, visually stunning. It moved me deeply for reasons that were entirely personal. The statue was of my teacher, my Guru, Sri Chinmoy, who passed away in 2007. I knew him for almost 40 years, as mentor, guide, friend, but he had a role to play out there on the world stage. I first met Sri Chinmoy on a cold December night in 1970. He was giving a lecture in Glasgow University’s Catholic Chaplaincy, and I was profoundly impressed, as much by his being, his presence, his sheer poise, as by what he had to say. (At one point, I recall, he chanted a Sanskrit mantra, then stood for a moment in silence, in his Indian robes, hands folded in front of him, in the exact same attitude portrayed, decades later, in that sculpture in Prague). This was someone who didn’t just talk about spiritual truths, he lived them and embodied them. The peace and light he radiated were palpable. I discovered he’d been born in what was then Bengal, and in the mid-1960s had moved to New York where he held regular peace meditations at the UN. This was an early indication of that wider role he was to play in those 40 years. Throughout that time I looked on in awe as he pushed himself ever harder, finding new, imaginative ways to communicate, to inspire. I knew him first as a philosopher, a spiritual teacher who also expressed himself eloquently through poetry and song. Later he immersed himself in drawing and painting, producing thousands of pictures, vibrant with color, executed with a vigorous, gestural energy, but often too with a rare delicacy, especially in his depiction of birds – glorious, soaring, joyful. He did everything with gusto, and brio, and on a grand scale. The late Leonard Bernstein once described him as ‘the very model of abundance in the creative life’ and in this he epitomised his own philosophy of ‘self-transcendence’ – pushing his own limits and inspiring others to do the same. This carried over into the world of athletics. He himself was a keen athlete – a decathlon champion in his youth, a marathon runner in later life. 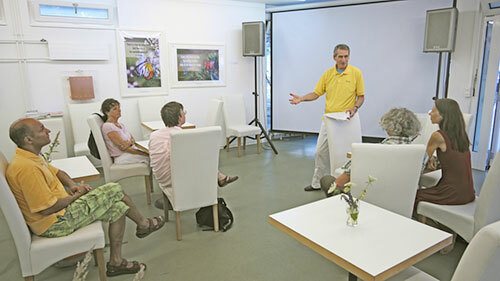 He emphasised the importance of a dynamic approach to living, nurturing body and soul. Countless athletic events have been organised in his name worldwide (including the perennially popular Wednesday night races throughout the summer months at the Meadows in Edinburgh, on a course designated a Sri Chinmoy Peace Mile). He was the inspiration behind the Oneness-Home Peace Run, a great global relay which has linked many thousands of people worldwide in a spirit of harmony and solidarity. When his own running was curtailed, in what seemed a surprising development he took up weightlifting, again pushing his limits, as he put it, ‘challenging impossibility’ and tapping in to a source of strength deep within, as if matter itself were bending to consciousness, to spiritual will. Over the decades, Sri Chinmoy traveled widely, lecturing and giving what he called peace concerts, singing and playing his own devotional music, often to audiences numbering thousands. After one memorable concert in Paris, a reviewer wrote about how astonishing it was to see one man simply stand with folded hands and impose silence on the vast crowd in the auditorium. The music grew out of that silence. The silence nurtured and sustained the music. (Again the image is the same – the folded hands, the power of peace). The message of peace, inner and outer, was always at the heart of Sri Chinmoy’s teaching. Imagining a world ‘flooded’ with peace, he wrote, ‘Who is going to bring about this radical change? It will be you, you and your brothers and sisters.’ His work for peace brought him into contact with some of the great peacemakers of our age. Nelson Mandela, Desmond Tutu and Mikhail Gorbachev all expressed their admiration and respect. He was deeply honoured when significant sites around the world were dedicated to peace in his name, as ‘Sri Chinmoy Peace Blossoms.’ These included, in Scotland, the Forth Bridge, the Isle of Skye, and the City of Edinburgh. Finally Scotland itself was dedicated as a Sri Chinmoy Peace Nation, in a declaration signed, with a flourish, by the late Donald Dewar in 1999. Sri Chinmoy wrote a song about Scotland, celebrating the country’s qualities. The key words were invention, action and discovery, as always looking at the positives (perhaps no bad thing as we move towards next year’s referendum). On his last visit to Scotland, in 2005, he held a ceremony at Edinburgh University, in his turn honoring men and women who had contributed greatly to the life and culture of this nation. In a unique extension of his weightlifting activities, and giving a new meaning to the words ‘spiritually uplifting’ he literally lifted each of them above his head on a specially designed platform. Among those he lifted that day were artist Calum Colvin, poets Tom Leonard and Valerie Gillies, and Iain Torrance, then Moderator of the General Assembly. It’s an occasion none of them is likely to forget, and Professor Torrance spoke eloquently about the unusual nature of the ceremony, and how important it was to find new ways of communicating the timeless truths. So that’s something of the background, explaining just a little about why that news footage of the statue in Prague affected me so deeply. I’m immensely grateful to have known this spiritual giant, for my life to have been touched and enriched by him. But beyond the personal, the image itself seemed iconic, symbolic. The figure stands, hands folded in supplication, invoking something higher, the highest and best in ourselves. It’s profoundly human, and at the same time transcendent. He also made the point that Sri Chinmoy had always had to “swim against the tide.” In an age of ugly materialism and greed, he championed the life of the spirit, a philosophy of oneness and inclusiveness. At his last, informal meeting with so few of his followers, he had spoken of the power of hope in our lives. Let us not underestimate the power of hope. No matter how fleeting its life, it offers to us the most convincing and fulfilling power. And perhaps that’s why this image itself, of the statue in Prague, is so powerful. In the face of everything, the floodwaters rising, we hold on to hope, we keep our heads above water, we go on. As it happens, another similar statue is being installed tomorrow in a Peace park in Ipswich (where Sri Chinmoy once meditated, and where regular races are held in his name). I’ll be giving a short talk at the dedication ceremony, as I did a year ago when another statue was unveiled on the waterfront in Cardiff. The statues are the work of sculptor Kaivalya Torpie from London, himself a lifelong devotee of Sri Chinmoy. (That’s what gives him the insight, the empathy to be able to capture something of the inwardness, the power of the subject matter). 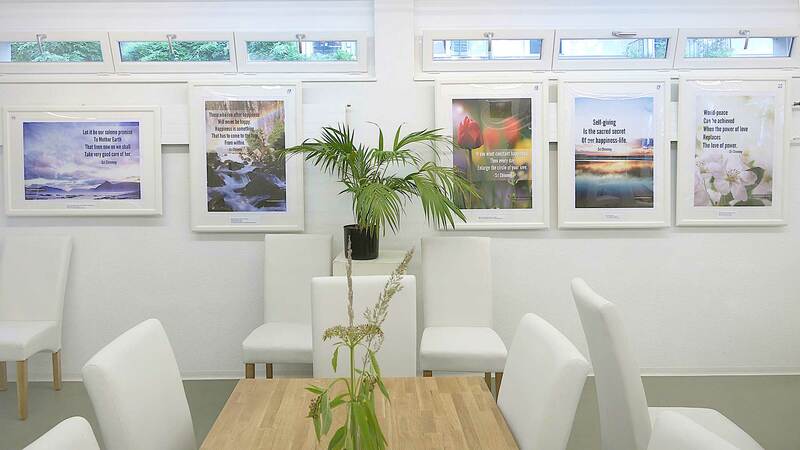 Since the opening of the new vegan Restaurant AMAZING STRENGTH at the Müllerstrasse in Zurich (not far from the main station) I was fascinated and attracted by the enterprise owned by the Soyana company, a very dynamic production place for organic tofu and related products. It all started with a Vegelateria, the first Swiss ice cream shop serving ice cream with natural and organic ingredients, not using milk products and white sugar, end of of January of this year. 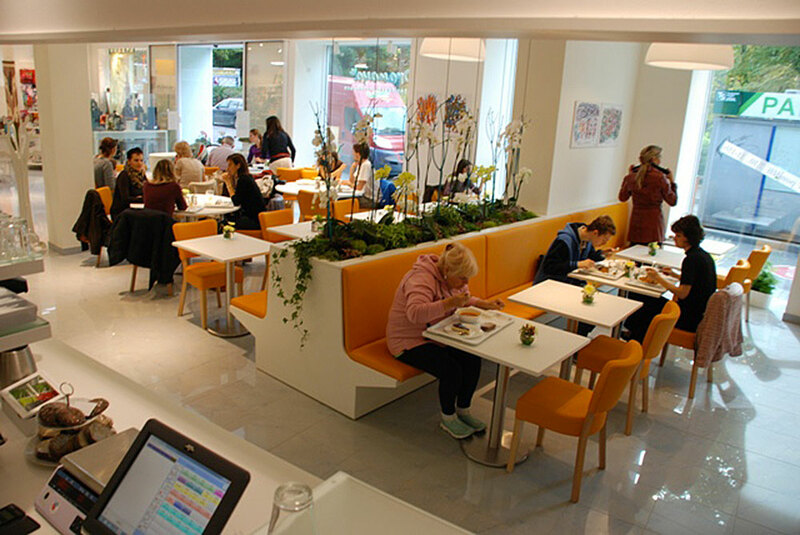 In the meantime the next step could be reached in offering 25 seats in the restaurant adjunct to the Vegelateria. And yesterday the third in a series of exhibitions and events opened: color panels with quotes by Sri Chinmoy on happiness. The book in connection with the exhibition is called “The Jewels of Happiness”. Author, creative artist and renowned peace visionary Sri Chinmoy offers timeless wisdom and simple exercises for readers of all backgrounds. 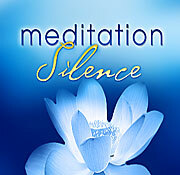 The complete audio book was released on March 12th with a launch on March 19th in New York City. Luminaries from all walks of life reach read a chapter from The Jewels of Happiness – including Archbishop Desmond Tutu, Addwitiya Roberta Flack, Narada Michael Walden and Sudhahota Carl Lewis! Perfectly suited to our fast-paced lifestyles, The Jewels of Happiness includes short, insightful sections full of uplifting wisdom, charming aphorisms and easy to learn exercises. Each section stands on its own-with the entire book forming a tapestry of inspiration. “You can have the most joy just by imagining a child infinitely more beautiful than any child that you have seen in this world,” writes Sri Chinmoy. “You have inside you a child who is infinitely more beautiful. Just imagine it. While imagining it, you will get utmost joy.” Each of the 13 chapters in The Jewels of Happiness is on a different theme, such as peace, joy, patience, enthusiasm, sincerity, love, self-giving, humility, compassion, self-trascendence, simplicity and forgiveness. At the opening of the exhibition there was also a screening of the film “happy” by Roko Belic. The movie takes us on a journey from the swamps of Louisiana to the slums of Kolkata in search of what really makes people happy. Combining real life stories of people from around the world and powerful interviews with the leading scientists in happiness research, the film explores the secrets behind our most valued emotion. The international Torch Run for Peace is back with its original name “Sri Chinmoy Oneness-Home Peace Run” and had a successful tour through Australia, organized by the Australian Sri Chinmoy Marathon Team. Watch the enthusiastic participants in this short summary.